See the newest floorplans for this year! When you’re building your dream home, you want it to be perfect. From the overall style of the home to features and custom amenities, it’s important to take the time to consider what your vision of a dream home actually looks like. 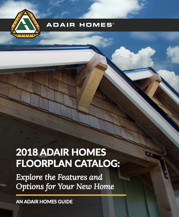 Download all of Adair’s floor plans and view comparisons of each model in our new catalog! Complete the form on the right to get your copy today!